For Israelis, this is the time of the return of the lie. Palestinian leader Mahmoud Abbas tells the UN General Assembly that Israel bears sole blame for the origins of the conflict, that Israel is the sole obstacle to resolving it, and that, in effect, the Jews have no connection to the land of Israel. And he receives a standing ovation. Israel, Obama was saying, deserves recognition not because of the Holocaust—an implicit point in his Cairo speech—but because Israel is the Jews’ historic homeland. In Cairo, Obama missed an opportunity to tell the Muslim world that the Jews are not a foreign transplant but an indigenous people returning home. And that omission was the beginning of Israeli disillusionment toward Obama. Now, though, the president was speaking clearly about Jewish history. But as it turned out, only Israelis seemed to be listening. The media response was largely contemptuous: Obama wasn’t motivated by moral clarity but by political expedience, addressing not the Muslim world but American Jewish voters. Three years of estrangement had their effect: When Obama finally spoke the truth, few seemed to believe he meant it. Bibi Netanyahu. In his UN speech, Netanyahu also told the truth: Israel is ready to pay the price for real peace, the Palestinians want a state without peace, and the uncertainty in the Arab world means that Israel requires security measures which the Palestinians refuse to consider. But telling the truth isn’t enough. In the coming weeks, Netanyahu needs to say explicitly: Israel accepts the 1967 borders as a starting point for negotiations, in exchange for a Palestinian declaration of acceptance of Israel as the homeland of the Jewish people. He needs to say so, first of all, because that is the basis for an eventual peace agreement. More urgently, he needs to shift the onus for the absence of peace back to where it belongs—on the Palestinian leadership, which denies the legitimacy of a Jewish state and seeks its unraveling through the “right of return” of the descendants of Palestinian refugees to Israel, rather than to a Palestinian state. Abbas has called the Palestinians’ UN bid “a moment of truth.” By exposing Palestinian rejectionism, Netanyahu can make this a moment for truth. As the Israeli newspaper Ma’ ariv sarcastically noted, “Moses was absent.” In a sense, Abbas’ speech was a response to Obama’s: The Jews have no legitimacy in the land. That is the message Palestinians routinely receive from Abbas’ media. Abbas, whose doctorate from the Oriental College in Moscow was based in part on Holocaust denial, remains a denier of Jewish history. There is a direct link between erasing the Jews from their own land and history and a view of the conflict which places all blame on Israel. In Abbas’ telling, there were no Israeli peace offers, only colonialist oppression. Palestinian history is entirely passive, a narrative of grievance. Abbas’ speech does indeed explain why there is no peace and no Palestine, but in the opposite way he intended. The United Nations. There is no worse place to try to heal the Arab-Israeli conflict. The UN doesn’t merely condemn Israel more than any other country, which would be scandal enough; it condemns Israel more than all other countries combined. According to the Geneva-based UN Watch, the UN Human Rights Council has adopted, in the last five years, about 70 resolutions condemning specific countries, 40 of which have been against Israel. In the General Assembly, about 20 anti-Israel resolutions are adopted each year, as opposed to five or six against other countries. And all that effort for the one national movement on the planet whose long-term goal isn’t just building its own state but destroying a neighboring state. That is the movement being celebrated by the UN above all other stateless peoples. One consequence of the UN’s Palestine obsession is the displacement of other crises. Here is Jordana Horn of the Jerusalem Post describing how Japan’s prime minister, Yoshihoko Noda, was received following Abbas’ speech: “The energy and concentration of the assembled diplomats dropped precipitously. Groups of diplomats left, not listening as … Noda spoke of the tragic earthquake that had befallen his country, and his land and people’s attempts to pick themselves up from horror and disaster.” Tibet, Kurdestan, starvation in Somalia—none of these tragedies merits the urgency accorded to Palestine. Bill Clinton. Perhaps the most bitter moment of this bitter week was provided by Bill Clinton, precisely because he’s a friend. 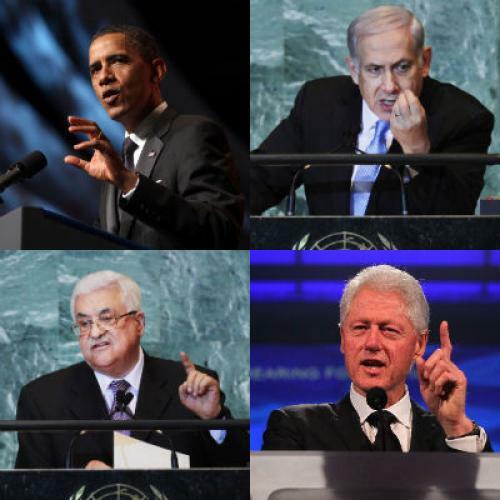 In a round-table with bloggers, Clinton blamed Netanyahu for the failure of the peace process over the last 15 years. “The two great tragedies in modern Middle Eastern politics … were Rabin’s assassination and Sharon’s stroke,” Clinton said. And if Rabin hadn’t been assassinated, would Yasser Arafat have made peace? It was Clinton who laid the blame for the failure of the Oslo process on Arafat. For the last decade, as apologists for Palestinian rejectionism tried to obscure that fact, Clinton remained a voice for truth. But now, hatred of Netanyahu apparently justifies falsifying the historical record and undermining Clinton’s own integrity. Clinton also blamed the one million Israeli citizens who came from the former Soviet Union in the early 1990s. “You’ve had all these immigrants coming in from Soviet Union, and they have no history in Israel proper, so the traditional claims of the Palestinians have less weight with them.” But might one reason for the skepticism of Russian Israelis toward a two-state solution be that they came of age as Israelis during the second intifada—when Palestinians responded to Israel’s peace overtures with exploding buses? Might another reason be the thousands of missiles that fell on southern Israel following the Gaza withdrawal in 2005? Might the fear of Russian immigrants—and of veteran Israelis—toward a Palestinian state in the hills overlooking Tel Aviv be based on a knowledge of geography, rather than an ignorance of history? Savvy friends of Israel know that the strength of the American-Israeli relationship depends on bipartisanship, and that Israel’s interests are not served by becoming a wedge issue between the two parties. Obama’s speech was an essential step in reaffirming that bipartisanship. It’s too bad that Bill Clinton, of all people, has just reinforced the arguments of those who are trying to portray the Democrats as the “blame Israel” party. As Clinton well knows, the truth has a way of taking its revenge against those who would deny it. Yossi Klein Halevi is a contributing editor to The New Republic and a fellow at the Shalom Hartman Institute in Jerusalem.